Meaningless football is still football, so of course we still watched the 2019 Pro Bowl even though defense was optional, along with any semblance of urgency. And you know what? 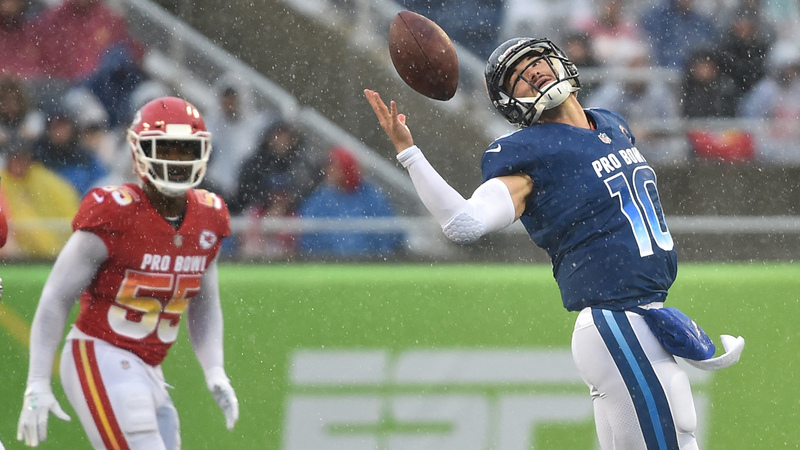 There were some pretty fun moments out there in the pouring rain in Orlando, Fla. as the AFC All-Stars ran away with the game, 26-7. There were, of course, some stinkers on display, too. These were the biggest winners and losers from the 2019 Pro Bowl. It should surprise absolutely nobody that the future MVP of the league came out firing and got his team up early on Sunday. 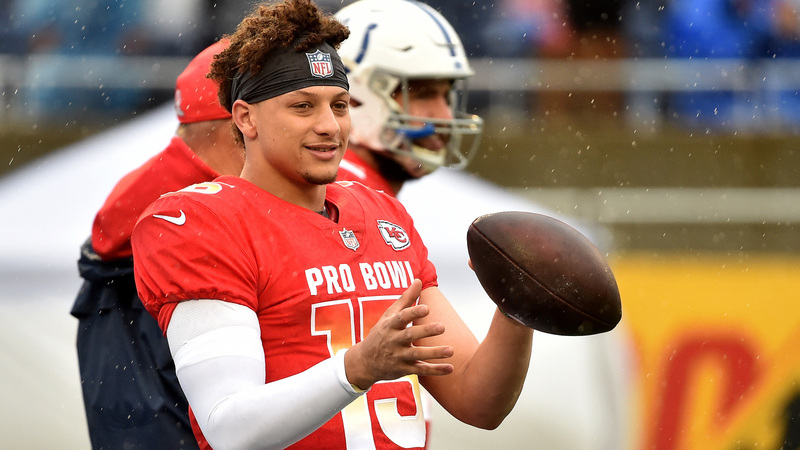 Following up his legendary 2018 season, Mahomes helped the AFC All-Stars go up 14-0 before exiting the game for good. Along the way, he threw for 156 yards and a way-too-easy touchdown to Eric Ebron. 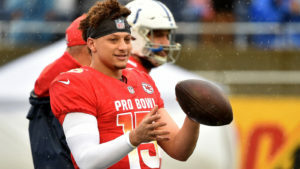 No other quarterback came close to matching what Mahomes did in the Pro Bowl, and the AFC never looked back after Mahomes left the field. Sure, it was wet. Sure, these players don’t really have any chemistry. But, my goodness, what the NFC’s offense did (or more aptly, what it didn’t do) was staggering. 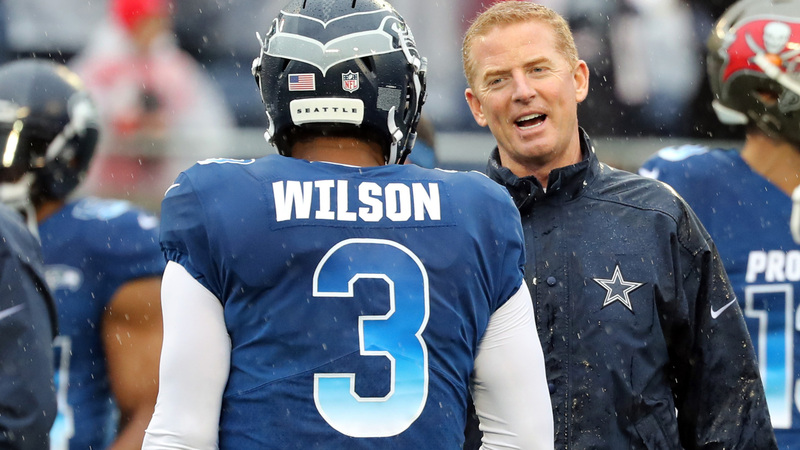 No matter how you look at it, the NFC offense failed miserably. Giving up six sacks. Going for a grand total of 159 yards. Gaining just 10 first downs. It all stunk. And then, as if to highlight the entire pathetic outing, Amari Cooper let a sure touchdown bounce right off his facemask in the fourth quarter. But hey, at least Saquon Barkley, Ezekiel Elliott and Alvin Kamara got to rush the passer, right? 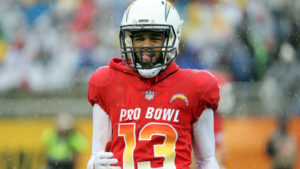 Out of all the big-time playmakers in Sunday’s Pro Bowl, Los Angeles Chargers receiver Keenan Allen stood out as the biggest winner. In the first half, he had four catches and went for 95 yards, including a 50-yarder from the hand of Patrick Mahomes. That 50-yard catch set up the second touchdown of the game for the AFC All-Stars, and he also hauled in a key 22-yard reception on 3rd-and-10 in the second quarter to keep a drive alive that led to a field goal. Chicago Bears quarterback Mitch Trubisky has a bright future ahead of him. But his performance on Sunday was about as cloudy as the sky in Orlando. Sure, he completed 5-of-9 total passes, but he managed just 34 yards. Even worse, he should have thrown two interceptions. 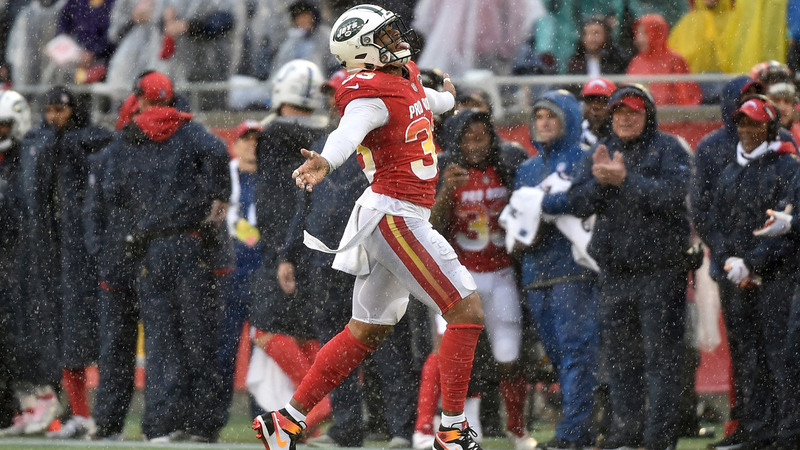 The first awful throw ended up being an incompletion thanks to Jamal Adams (more on that soon), and then his second — on the first play of the third quarter, was picked off. Just an awful, terrible decision that he’d love to have back. 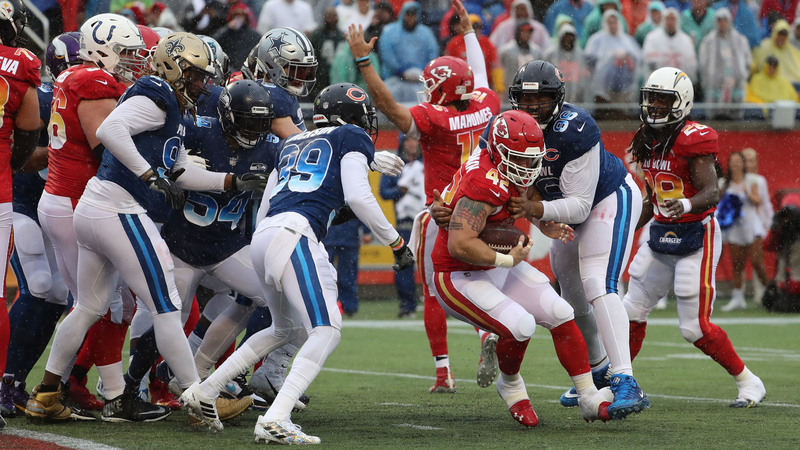 One of the most underrated, yet key players for Kansas City all year, fullback Anthony Sherman made his presence felt during the 2019 Pro Bowl. For starters, the powerful runner plowed his way into the end zone to help the AFC go up 14-0 early in the second quarter. Sherman also added three catches for 92 yards! Not bad for a guy who touched the ball a grand total of nine times all year. Earlier in the week, Jamal Adams made national headlines when he blew up the New England Patriots mascot during practice. Well, he had another huge hit in the Pro Bowl, too. Only this one was against his own teammate, and his big hit caused cornerback Xavien Howard to drop an interception. Even worse, Adams himself dropped an easy pick earlier in the first half. So, he was responsible for two missed opportunities on what should have been easy turnovers. Though, he did have some fun in the second half when he illegally lined up on the line of scrimmage and blew up Mitch Trubisky on a would-be flea-flicker. Then, just a couple plays later, he came up with a very easy pick on a trick play gone terribly wrong. So, we can’t necessarily say Adams was a huge loser, but we can’t say he was a winner, either. 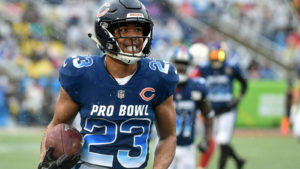 On a wet, rainy day that saw stellar ball hawks like Jamal Adams and Malcolm Jenkins drop easy interceptions, Chicago Bears cornerback Kyle Fuller was locked in. In the second quarter as Andrew Luck took over for the AFC offense, Fuller read the route JuJu Smith-Schuster was running and actually beat him to the spot. Then, as Luck tried to fire the ball to his receiver, Fuller made a tremendous play to pick the ball off. #GoBears Kyle Fuller tied for #NFL lead in INT. He comes up with one against #Colts Andrew Luck here.